So simple yet so delicious and perfect for the holiday season! 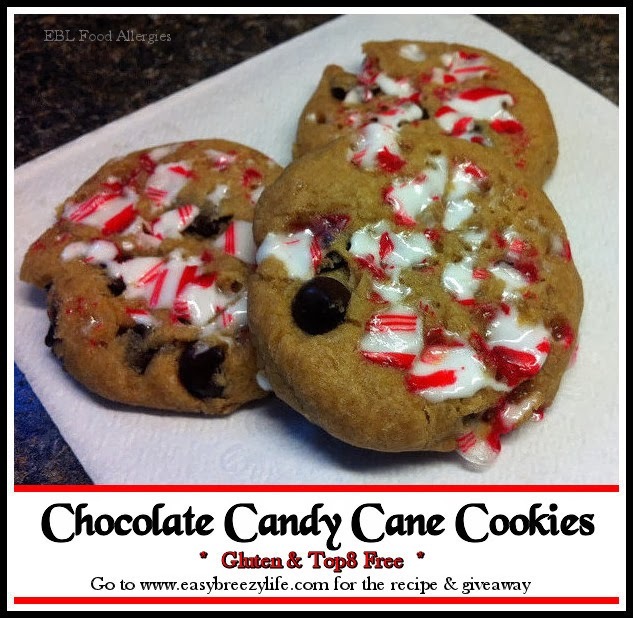 These chocolate candy cane cookies are gluten free, top8free (dairy free, soy free, egg free, peanut free, tree nut free, fish free, shellfish free) and wheat free but they taste WONDERFUL! My little guy plans on leaving some just like these for Santa this year. First, we’ll start off with the SUPER easy recipe. 2. using half of the cookie mix, beat in the shortening. Add the egg and water and continue mixing. 3. add the remaining amount of cookie mix and mix thoroughly and fold the chocolate chips into the mix. 4. scoop 2Tablespoons of cookie dough at a time, and using your hands firmly press mixture into a ball then flatten it a little. Press one side of the flattened ball into the crushed candy cane and drop onto ungreased cookie sheet, candy cane side up. 6. allow to cool for 5 minutes then transfer to a cooling rack to finish cooling. Next, enter below to win a package of the NEW dark chocolate morsels by Enjoy Life Foods! They are made with 69% cacao and they are non GMO (love that). They are also gluten free and free of the top 8 allergens. Ingredients: Unsweetened Chocolate, Cane Sugar. Looks delicious! I'm not entering the contest, since I've already had a bag sent my way. 😀 By coincidence, since we are apparently leading parallel lives, I'm working on a candy cane cookie recipe, too. (Mine's chocolate peppermint bark bars, not gluten free though.) What brand of candy canes did you use, Spanglers? Also what did you find was best method to crush up, bag and rolling pin or food processor? It was so good to see you again at FABlogCon, and I'm looking forward to your surprise announcement! Did you say February? 😀 Good luck with the mystery plans! I'm not sure of the candy cane brand. The recycling already picked up this week with the package along with it. I'll be sure to look for your peppermint bark bars. I'm sure they'll be delicious! I have never tried anything by Enjoy Life, but I would certainly love to.